Is there anything you can't do with a canning jar? They can be used to freeze homemade margarita mix, ferment pickles, display a collection of beach glass, organize screws and nails, and store bulk grains. So it should come as no surprise that there’s yet another amazing (and handy) thing you can do with canning jars: they make a perfect container for a lunch-on-the-go. 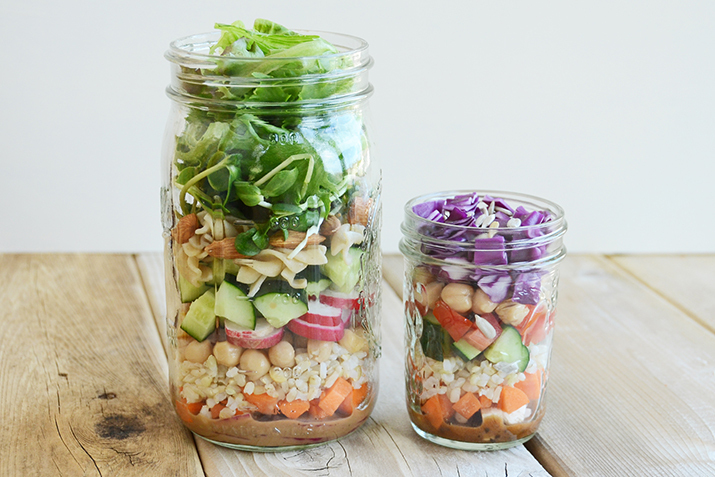 Meet your new fresh and healthy friend: salad in a jar. Add 1-2 tablespoons of your favorite dressing to the jar. Next, add the hardest, least-absorbent ingredients. Chopped veggies like carrots, celery, fennel and onion can marinate in the dressing on the bottom and absorb flavor without compromising their texture. Next, add cooked beans and/or firm grains like rice, barley or spelt; things that won’t get too soggy if they sit on top of, or in, the dressing. Proteins such as tofu, cooked chicken, ham, or tuna can be added next. Then add cheese and any softer veggies or fruits that are complementary to your mix. Berries, sliced apples and pears are good seasonal choices, but don’t forget dried fruits like raisins or cranberries that are nice year-round. Next add cooked, light, absorbent grains like quinoa or couscous, or pasta. Then seeds, nuts or croutons—stuff you’d like to keep fairly crunchy. Finally, fill to the top with chopped salad greens. Twist on the top, stick the salad in the fridge, and you’re good to go! When you’re ready to eat, the salad will be dressed by the act of emptying the jar, so shaking is not necessary but you can give it a gentle shake just before emptying if you like. Enjoy your fresh, crisp salad and be prepared to soak up compliments around the lunch table with your fun and functional salad in a jar. Ready to try it? This Classic Chopped Salad is a perfect candidate for Salad in a Jar! Want to address your dressing skills? Casey Wilcox will show you how to whip together three fresh dressings: ginger jalapeno, lemon vinaigrette, and warm bacon dressing in the Co+op Kitchen. Can’t get enough of that green, leafy stuff? Read more about summer salads and spring salads.